This is Shaunna's GEAR list. Shaunna appreciates all the companies that endorse her and support artists, which is really what enables us to do what we do. THANK YOU!! I play a James Trussart Steele Paul (2002), I have used it primarily in P-Funk, live and studio work between 2002 and 2009. This is a great sounding guitar that looks great on the stage. from our tourbus while parked at a gig in Memphis. of the Shelby Country Sheriff's Dept. June 3, 2012, so now I have TWIN Handles!!! The Eleven Rack has totally changed the way approach live performances. The Eleven Rack is a guitar amp modeler/Multi-Effect/Digital IO and mush more. And the component software which plugs into your ProTools session is an invaluable tool. The Eleven Rack is the first amp modeler I have ever used live with P-Funk, and it sound like my physical amp, only better. Sometimes when I;m practicing at home, I ooh around for my amp and them remember in the Eleven going straight into the mixing console. !!!!! 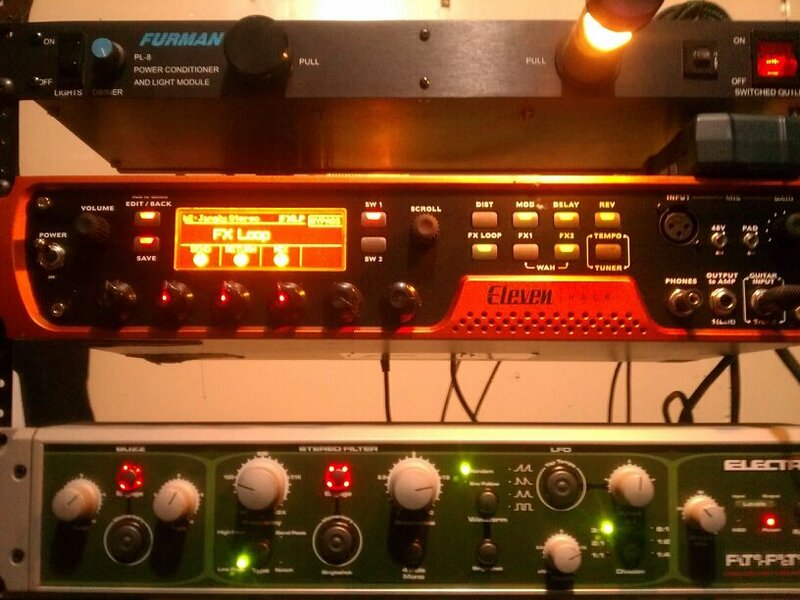 the Electrix Repeater, as well as Ableton live and ProTools for hands free tracking in my laboratory. Watch KMI for many cool GAME CHANGING products. Seriously, don't sleep on KMI!! I have used Mesa Boogie Amps almost exclusively since 1989. I started with the 1x12 50 Calibur Combo and never looked back. I use a tremoverb head with a 4 x 12 cabinet for P-Funk, and I use a V-Twin Rack with a 50-50 Stereo Power Amp and a 2x12 Cab for clubs and small stages around town. I also own a few 1x12 wedges. I absolutely love my N-Tune, which is built right into my volume knob. Put a litte harmony in your life. Bruce Zinky is a true genius madman and his amps are smokin'!! I have been using D R Strings since 1990. I don't know what it is about these strings, but I love them. And now they come in colors!! Pedalboard and road case. Where would I be without my pedal train? Sofware modeling drum machines, synths and all sorts of other cool stuff. I used these programs to make tracks for E-Funk and more. Tone Tubby , A Brown Soun, Inc. Speakers made from hemp. These speakers are the BEST sounding speakers I have ever heard. Period. Another Bay Area Original! !